Out of 37 games played in total, we've won 2 and drawn 5 with Govan's finest winning the other 28. We've played them 11 times in the cup - the first of all being a famous 4-3 victory back in 1884 before a very dubious decision was made to compel a replay on the basis that (old) Gayfield's pitch dimensions were not quite up to scrach (Brechin are you listening?). We lost the replay the next week 1-8. Maybe that makes us one of the first victims of the inherent official bias towards the Old Firm - whatever their respective paranoia suggests. 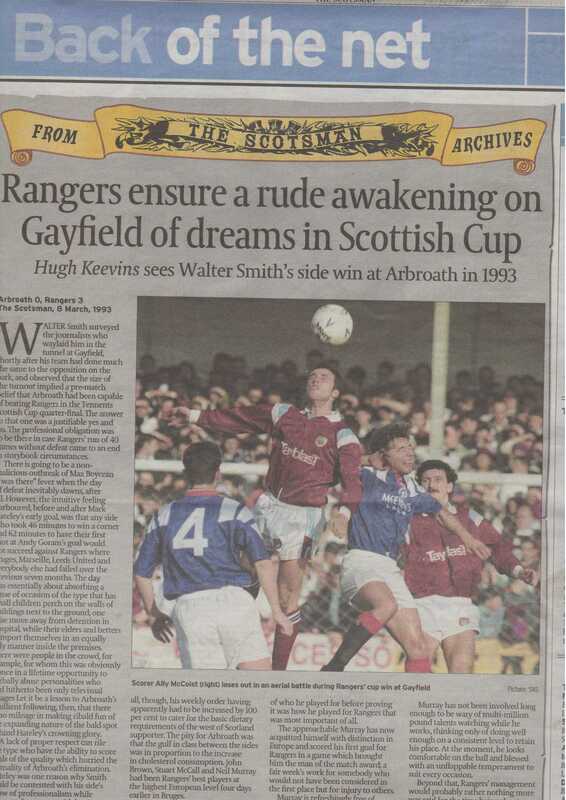 Here's some press coverage from the Scotsman of our last but one home Scottish cuptie against Rangers - back in 1993.